Marvel was both riding a sales high and playing a dangerous game with marketing in 1996. Comic sales were beginning to flag as Marvel started pushing out more and more events to recapture interest. The Avengers were betrayed by one of their own, Iron Man himself. The Spider-Man comics were shuffled up with a clone having been Spider-Man for the past several years (coincidentally granting critical people in the editorial a wifeless Spidey, which was how “their” Spidey had been). To make matters worse, when Marvel wasn’t churning out minor event after minor event, the books themselves tried their best to trick readers into continuing to read. The Fantastic Four under Tom DeFalco became a book almost entirely comprised of subplots spinning their wheels. The Clone-Saga as mentioned earlier infested every Spider-Man book into a continuous spiral with enough twists and turns to make even dedicated fans lose track over the years. Tony Stark found himself replaced by his teenage self from the past for reasons too complicated to care about anymore. Captain America wound up trapped in a suit of armor while his body began to fail from the Super Soldier Serum wearing out. Nick Fury (the old, white WWII veteran - not the one inspired by Samuel L. Jackson) died, allegedly killed by the Punisher. Even Marvel’s critically acclaimed 2099 sub-line wound up getting canceled, thanks to a creator walkout once beloved editor Joey Cavalieri was fired. 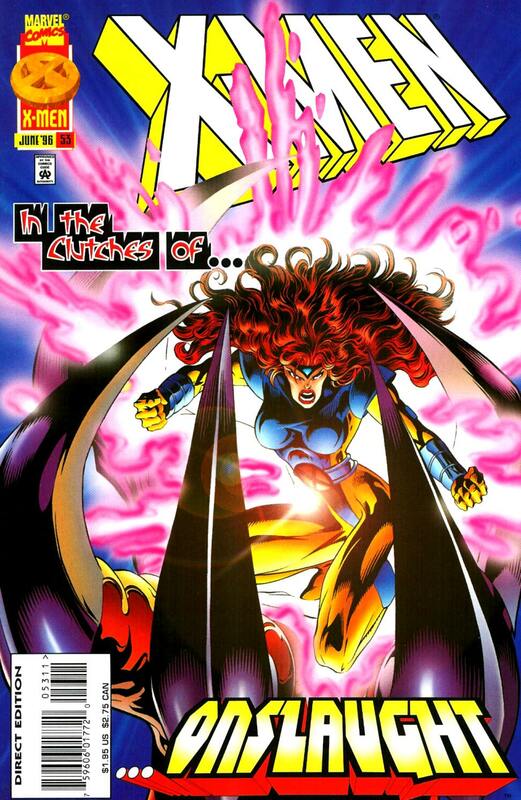 However, the X-Men and their comics had been building to something big. An event that was sprawling, and half-planned, half-improvised. Starting back five years ago, when the X-Man named Lucas Bishop was introduced, claiming to be from the future with the knowledge that someone would betray the X-Men, and would cause his dark future to come to pass. In the meantime, Marvel was planning on farming out some of their lower-selling books to the guys at Image for some cheaper comics that might sell well. Ironically considering recent movie successes, these would be the Avengers, Captain America, Iron Man, and the Fantastic Four. The heroes who had helped launch Marvel had fallen by the wayside, and this event would be a perfect way to sweep them out of the main continuity and into the waiting hands of Jim Lee and Rob Liefeld. 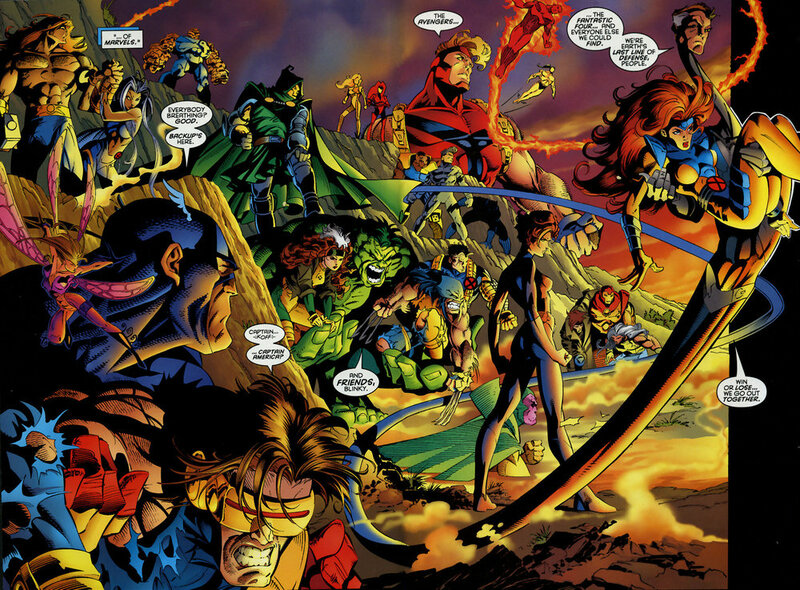 This era would become known as Heroes Reborn, and the duo was given a year trial basis. Marketing went on a significant blitz, putting this villain’s name everywhere in comics. Writers and artists were also drawn in, adding in references to the villain in almost every issue somewhere. This push only brought up even more buzz in the fandom. Who, or what, was Onslaught? The reveal was massive. After taking out the Juggernaut in seconds, it was eventually revealed that Onslaught was Professor Charles Xavier! For those keeping score, this is about the fourth time Xavier has been evil, or gone evil, or had an evil half. At least this one wouldn’t sexually assault his students and destroy millions of innocent lives. No, seriously, go check out X-Men / Micronauts. It’s even worse than it sounds. This time, Xavier would have this weird plot to make a world without mutants, by using the powers of Nate Gray and Franklin Richards. He would also try to distract everyone with Sentinels being sent everywhere. Every single book Marvel had at the time was involved in this story, aside from the 2099 books mentioned above. The Punisher went to help keep the crashed SHIELD Helicarrier from falling into the hands of the Maggia. The Avengers went underground to avoid being killed by Sentinels. Spider-Man and his clone took the Sentinels head-on. The heroic Green Goblin would save the Daily Bugle by taking on a Sentinel as well. The Fantastic Four would help the X-Men try to locate Onslaught, while Hulk just sat around and Hulked. It was apparent, the heroes had no way to stop Onslaught, and it all came to a head in the final issue: Onslaught Marvel Universe. Throughout a massive double-sized issue, the combined forces of the X-Men, Avengers, Fantastic Four, and just about every other major Marvel hero fought against the might of Onslaught. With his physical form finally destroyed, Onslaught evolved into a being of pure energy. With pure mutant power, Onslaught was unstoppable, until Thor threw himself inside. The X-Men watched helplessly as hero, after hero hurled themselves inside, absorbing more and more of the Onslaught essence. The final fight left the world bereft of trusted heroes, and villains like Apocalypse waiting in the wings to enact their vengeance on the Earth. Onslaught had a ridiculous effect on Marvel. While they would probably have been canceled anyhow, the Avengers were gone. The Fantastic Four were also missing, presumed dead. With a shortage of Heroes, things began to be a little darker in Marvel for a year. With those teams gone, long-time Captain America villain Baron Zemo took a chance and formed the Thunderbolts, a group of villains pretending to be heroes. The Heroes Reborn concept would completely crash and burn, both critically and sales wise. Marvel would not renew the contract and would launch a “Heroes Return” campaign to welcome them back to the main continuity. This calamity would result in some of the more acclaimed runs in their respective comics, such as Kurt Busieck’s Avengers. Onslaught is a perfect panorama of Marvel in the 90s, with the X-Men being front and center. There’s hardly a book not featured at least once with a scant tie-in to the event. Spider-Man’s Clone Saga. Teenage Tony Stark. Professor Hulk. “Savage” Wolverine. If you want to know what Marvel was like in 1996, it’s hard to do worse. Once the talk of the town, Onslaught hasn’t aged well. 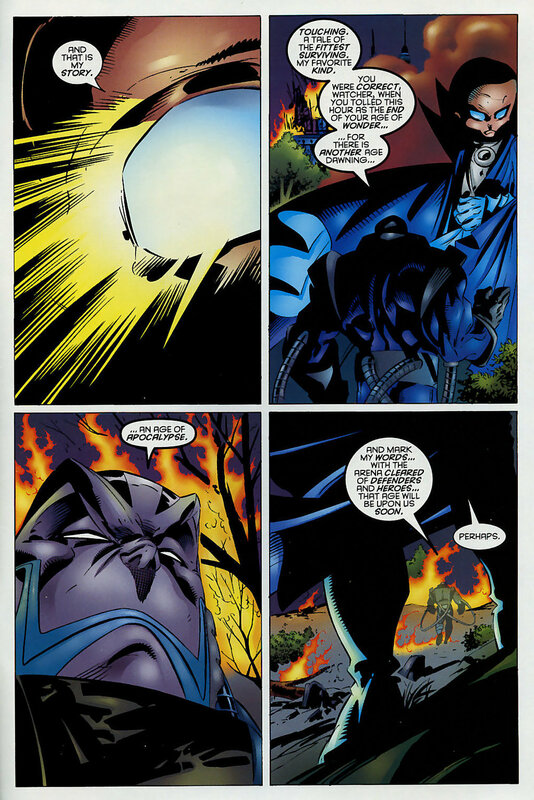 It’s a mystery surrounding who (or what) is Onslaught that ends in a massive punch-up. It’s unbalanced towards the X-Men franchise despite heavily involving the Fantastic Four on a plot level. Spider-Man and Peter Parker go charging into Central Park to help out for the final story only to never appear at all in the end. Finally, the emotional punch of the Avengers and Fantastic Four charging into their death falls flat when their books are still being published to this day while Onslaught is less than a footnote. Still, it’s hard to beat the entire Marvel Universe teaming up to pound on Professor Xavier’s brain.